Please refer to our stock # T 1833 when inquiring. Pre assay Mexico era. 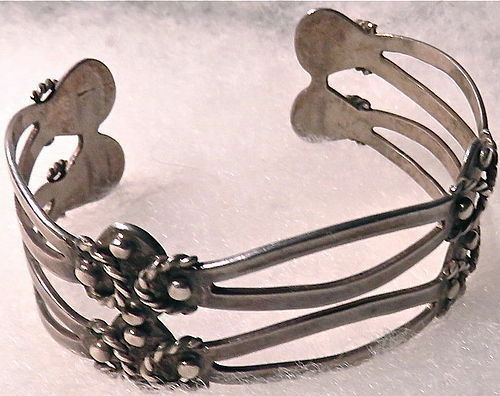 Both Maricela and Los Ballesteros and maybe Rafael Melendez along with other Taxco silversmiths have made this style of bench cut - not cast -2 tier cuff bracelet with applied C shape rope elements and "dot" application. Mark: 980 Taxco - 980 is finer than sterling and less commonly found, yet very desirable for collecting. Other info: have had and sold in this style both Maricela and Los Ballesteros here at www.mimideeartwear.com along with 2 rings in the same design! This style sells quickly both here and on other Trocadero Mexican jewelry sites. Condition: Very good vintage pre owned condition. Needs a good cleaning and polishing / buffing would make this shine like new! Make this yours today! $12 USPS Priority/Ins/Track or Free with your USA Ck or USPS MO.